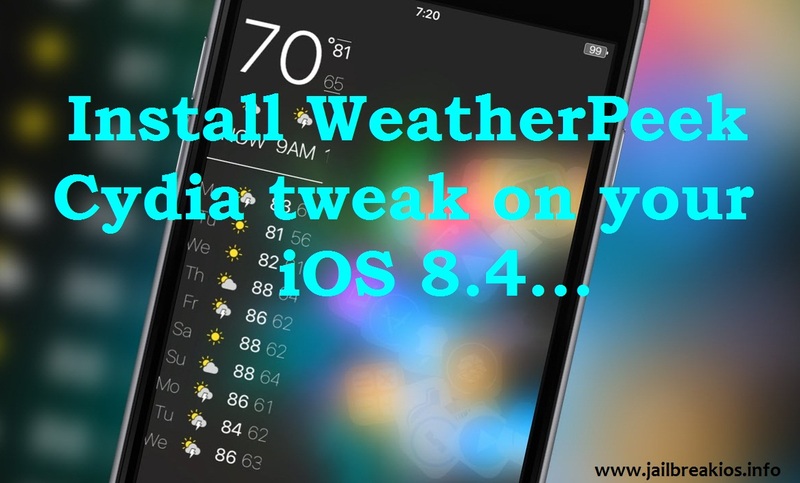 How to install WeatherPeek tweak on iOS 8.4 jailbroken iPhone? Don’t you like to get weather highlights directly from your Lock Screen, Spotlight or from the Home screen? Surely the answer must be yes. 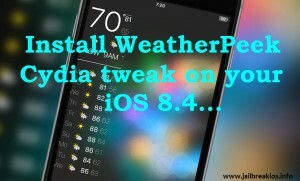 So just get the WeatherPeek jailbreak tweak on your device to have it simply. This is another tremendous jailbreak tool among iOS 8.4 users, who made their devices jailbroken. And this was invented by AtomDev Team. Anyhow when you install WeatherPeek tweak on your device, you are able to get details about current weather simply. The clock of your device will replace the temperature. Also you will have it along with a weather prediction at different times of the day. Form the separation of free and offered tweaks this can separate to the list of offered to get from Cydia BigBoss Repo. By the way guide of installation will appear on your Spotlight automatically, when you start the install of WeatherPeek. You will have to select the current location. Then the temperature unit and some other options too. But you don’t need to enable Location Services or the Weather ID; as it will automatically process, when you select the City you are from the map which will show appear on your screen. And also the tweak has its additional setting to reach from the separate preferences pane in settings. Choose Normal or the Minimal look of the information of weather. Remember to enable the lock screen on your Spotlight. Lock screen or Home screen. This will be a great experience for you to reach news of weather instantly using your formal iDevice. And also if you need to plane an outdoor program you just have to take a look of your device to know all about weather. Anyhow you are able to have to more and more tweaks using current Taig tools for iOS 8.4 devices. As you already know the list of the tweaks are stretched with new Taig tools. Therefore suggest your friends too, to jailbreak their devices and get those tweaks on their device to make work serene. And stay with us to reach new details of Apple and jailbreak tools as well.